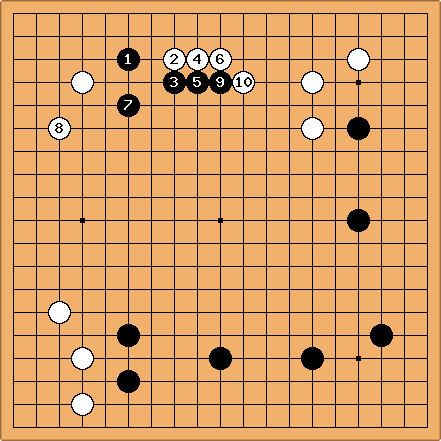 I think Mr. Dinerchtein read the last entry in the Strange Openings series: the 62nd Goama newsletter featured a game between Zhang Wendong 9-dan versus Liao Xingwen 1-dan. Zhang opens with a decidedly non-standard pattern. I have the (rather unhappy) feeling that he plays this way because he expects it to be a bit of a crush match: an experienced 9-dan versus a thirteen year old shodan. Andy Pierce: I've seen RoseDuke use this opening as black several times on IGS. Through 14, I feel black has a good position. A strong player's analysis of this would be helpful, but seems to work well with , and the bottom is well-constructed, though high. I speculate that is a mistake; it looks like the sort of move strong players criticize me for. ...and suddenly it seems white is coming under a stronger attack than Black. 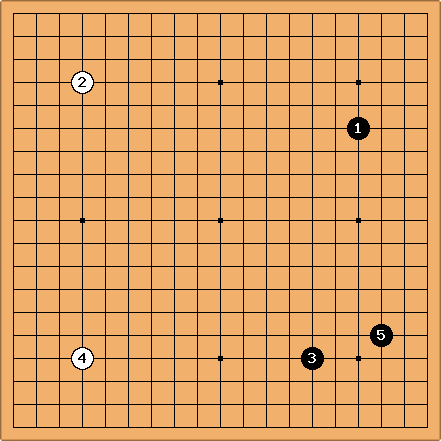 In fact, the white wall leads to essentially no territory: throughout the middlegame, it marches sedately across the dame points. In the end, it comes to six points(!). 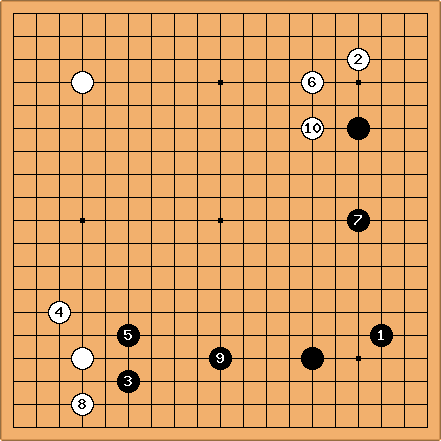 Here Black wins by resignation. Once again, it's hard to judge the relative merits of the opening; hopefully, this style will be played in more even games in the future. 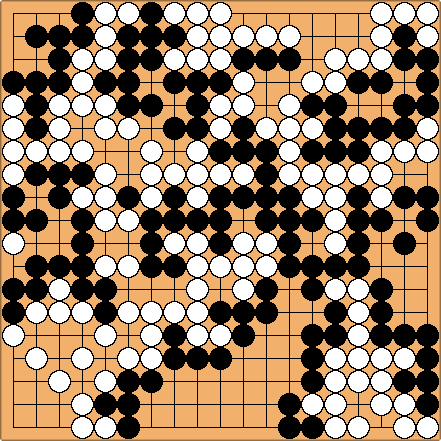 If you're interested, the whole game is available, courtesy of go4go.